The following packages include circuit and firmware. usbasp.2011-05-28.tar.gz (519 kB) TPI support (upcoming release of avrdude will use it), supports programmers with ATMega88 and ATMega8. 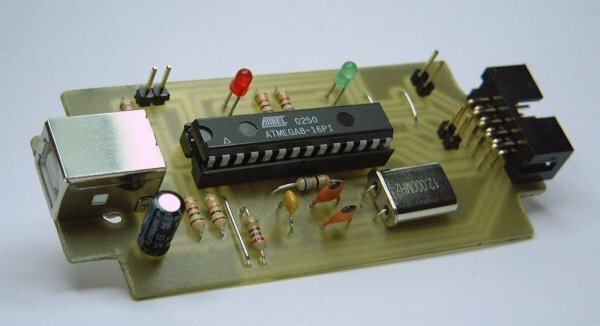 usbasp.2006-12-29.tar.gz (118 kB) Supports programmers with ATMega48 and ATMega8. usbasp.2006-09-16.tar.gz (116 kB) New VID/PID! Please refer to Readme.txt for details on building, installing and using USBasp. Here is a list of tested PCB layouts. If you have designed your own PCB, please let me know. The board is single sided (EAGLE format), measures 3 by 8 cm and uses only regular components. 3.3V version, ATMega48 only. Single-side PCB, ExpressPCB layout format + socket board for varies AVRs. 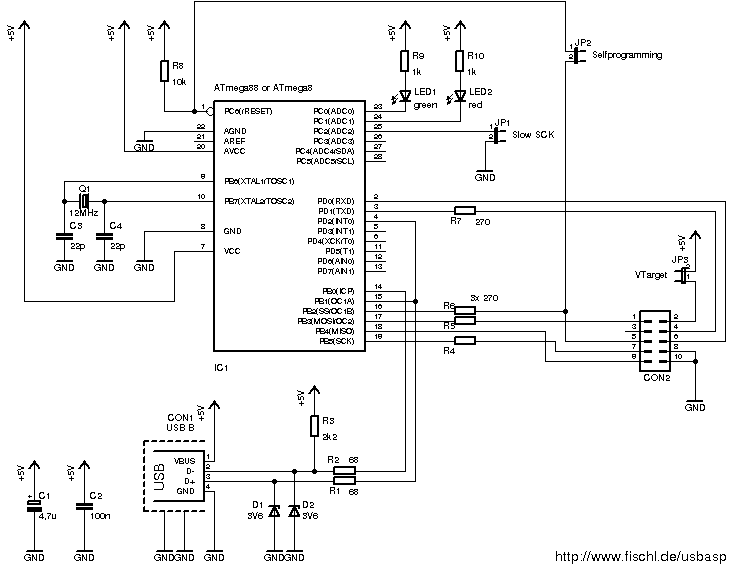 Without future serial interface, chip initially must be programmed with another programmer. Very small USB key like dimensions. SMD parts.